WOWCAST BLOG: Netherwhelp, all that? Even Mini Diablo? It blows fire! I chose the panda on my first toon, and all it did was sleep. It suited though, since I was a hunter. Guess I was expecting it to dance or something. Diablo all the way now... on every toon. I hope I don't offend too many people but I was really dissapointed in the netherwhelp pet. It's the same body type as the black, green, and red whelp pets already in the game. 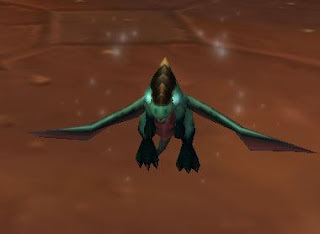 And the black whelp is the coolest by far of those. The netherwhelp is turquoise. Why turquoise?! Any other color but turqoise! Pink? Purple? I thought you'd get a lot more choices but apparently you don't. And I really thought the body type would look more like a dragon rather than a whelp for some reason. This is one time I'm glad I didn't dish out cash for the CE. However, the soundtrack may be well worth the money itself. We'll see. Who knows, maybe when you hit level 70, the netherwhelp will grow into an adult and you can ride it for free! lol! now THAT would be worth it! I don't have any special CE pets or even the murloc. I do have the rare white kitten after camping lil' Timmy for two hours in SW. but it's really not so rare anymore. On my mage character, I tried to get very pet possible in the game. After that, I decided I would only have one pet per character and that pet would have to fit my class. But I plan on talking about pets in a future episode so more on that lataz! Pandas FTW! zzzzzzz! 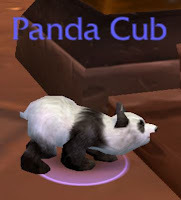 I promise to pick a panda cub next time I roll a toon in jae (which may be a loooooong time in my case). The Netherwelp is cute, but I agree that there should have been SOMETHING cool about it. Oh, and Zergling ftl. I hate it. Why did I pick it? WHY? After seeing a 3d shot of the netherwhelp i gotta agree it looks a little odd shaped. And If I was playing WoW when it got released I would have picked up the CE. The only thing I don't like about pets is that I can be stealthed and my pet will still be there. And if you want I could send you a copy of CE stuff so you can use the music and such on your podcast. Send me a mail at Ragnorok161@yahoo.com if your interested. I'm not offended by your comment, I kinda agree. Best pet in game by far is the Jubling, or Jubs the Beer Drinking Frog as I affectionately refer to him. Any pet that will chase after a mug of Dark Iron Ale and slurp it down is the pet for me. Ok I set up the files online, I mailed you the torrent file so you can download the files. I will host the DVD soon for you.